Most homeowners are simply unaware how important the "recovery rate" is when selecting a water heater. Recovery rate is defined as the number of gallons heated in 1 hour by 90°. In other words, if the incoming water is 50°, the recovery rate would equal how many gallons the appliance can heat to 140° (50°+90°) in 1 hour. Recovery rate and tank capacity are often very close in value for residential units (see photo & click to enlarge). Tank capacity is somewhat misleading. I have inspected water heaters for 12 flats that are similar in size to a 50 or 75 gallon tank but the recovery rates are 200 gallons/hour! Many home owners believe bigger is better for this appliance and that is simply not true. 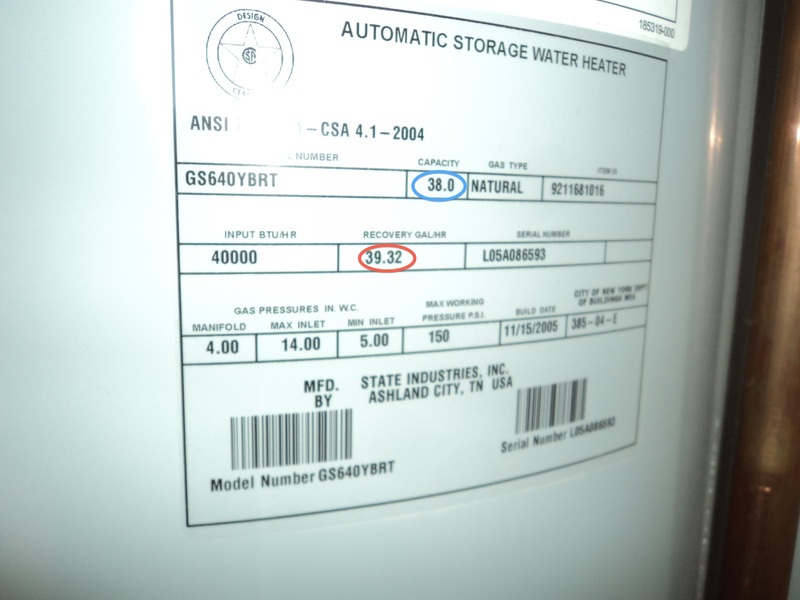 Tankless water heaters are coming but thats a completely different discussion. In the mean time, think "recovery rate" and a relatively small tank capacity. Improving your water heater's efficiency can be as easy as turning down your water heater thermostat (no lower than 55ºC and no higher than 60ºC) and insulating your pipes. If you have an old inefficient heater, replacing it with a more efficient unit will bring you the most long-term savings.